In 1945, toward the end of the war, a group of Russian soldiers answered a distress call that would lead them deeper into Germany. Cut off from their command, they have no choice but to investigate the eerie, repeating message. What they find is unsettling. Who burned this convent? What are these strange machines? Why do these zombies have knives for hands? Fair questions, to be sure. At this point it would have been reasonable to sprint back to Moscow in one go, but our heroes press on to discover that Dr. Viktor Frankenstein, a descendent of the original Frankenstein himself, has been up to no good making walking atrocities. These include the hulking Propeller Head, the stitched up Burn Match Man, and, of course, Mosquito Man himself. His brain has been replaced with a motor to power the long, deadly drill spouting out of his face, and his new metal limbs mean he can cover ground lightning quick. That’s a big problem for our heroes. There’s not enough vodka in Russia to get over seeing something like that! 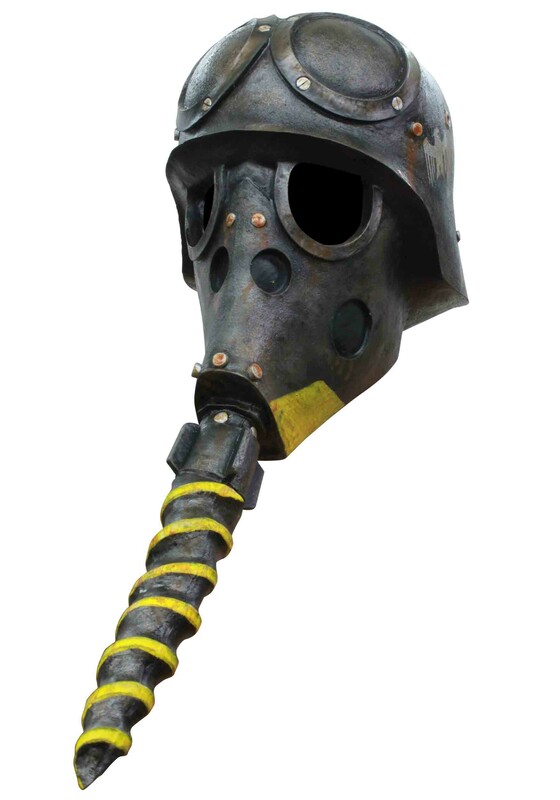 Our Mosquito Man mask looks almost as good as the prop from Frankenstein’s Army itself. Its eye holes are meshed out, so people won’t be able to see where you’re looking -- unnerving, to be sure. When people see you in the Mosquito Man mask, they’ll want to call a SWAT team!